Automatic shutoff valve for reverse osmosis systems. This valve is pressure sensitive device. Inside the valve, a piston moves in relation to water pressure. When there is a lot of pressure on the pure water side (low water pressure side) of your RO system, the piston moves to close off the water supply to the system. When you open the faucet, water pressure is relieved in the tank and the line connected to it, consequently, the piston moves to allow tap water to enter the system. Built-in Quick connectors (Push-In-Tube connection) 1/4" NPT. The "IN� & OUT" markings are on the side of the valve that connects to the high pressure lines. 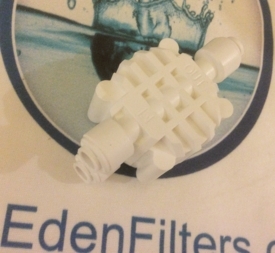 The high pressure line from the filter housings goes to the "IN". Then the high pressure "OUT" goes to the membrane housing inlet. The membrane housing product water line connects to either side on the low pressure side of the valve. The other port on the low pressure side goes to the tank.